There are only 6 million active businesses in America. Another 20 million are in name only according to Gallup. They report that “Of the 6 million, 3.8 million have four or fewer employees,” otherwise known as micro businesses. According to another study, most micro businesses never want to grow to more than 10 employees, which would place them among the one million businesses today with between 5 to 9 employees. That means there are “only 2 million small, medium and large businesses in the United States,” including about 1,000 companies in the “big business” category with 10,000 or more employees. For sources of “dark money” and undue, often opaque influence among lawmakers look to the larger employers, something shown in an investigative piece just re-published in Pacific Standard. For job creation, however, look to those first two groups, especially micro businesses. So how do we foster more of these concerns that generate the vast majority of new jobs? Some experts point to enforcing regulations evenly along with simplifying some. Most, however, point to making credit more available. The rub is that over the last 15 years, small business loan volume is down 14% and loans made to micro businesses are down a third. What happened? One indication is that since 2008 alone, one in four “local banks” have simply vanished. When I graduated from high school in 1966, more than 7 out of every 10 banks were small, single-office local banks, totally more than 10,000 nationwide. Branch banking had become the norm by the time I moved to Durham, NC in 1989. 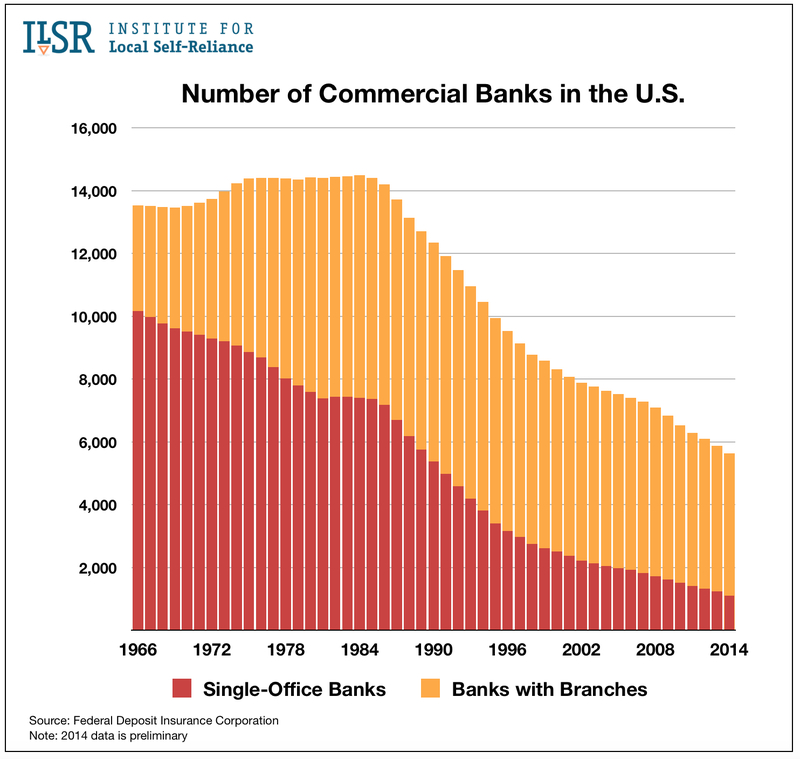 Today, there are half as many commercial banks overall as there were when I graduated from college in 1972 and fewer than 1,000 single-office or truly local banks in the entire country. Even so, small banks and credit unions make most of the loans to small businesses, including micro businesses. There are just fewer and fewer of them. Contrary to lobbyists, the decline of small, local banks isn’t due to regulatory reform after the great recession. Click here to download an excellent review of the reasons. Far more compelling is that this problem began with policy changes more than a decade earlier. 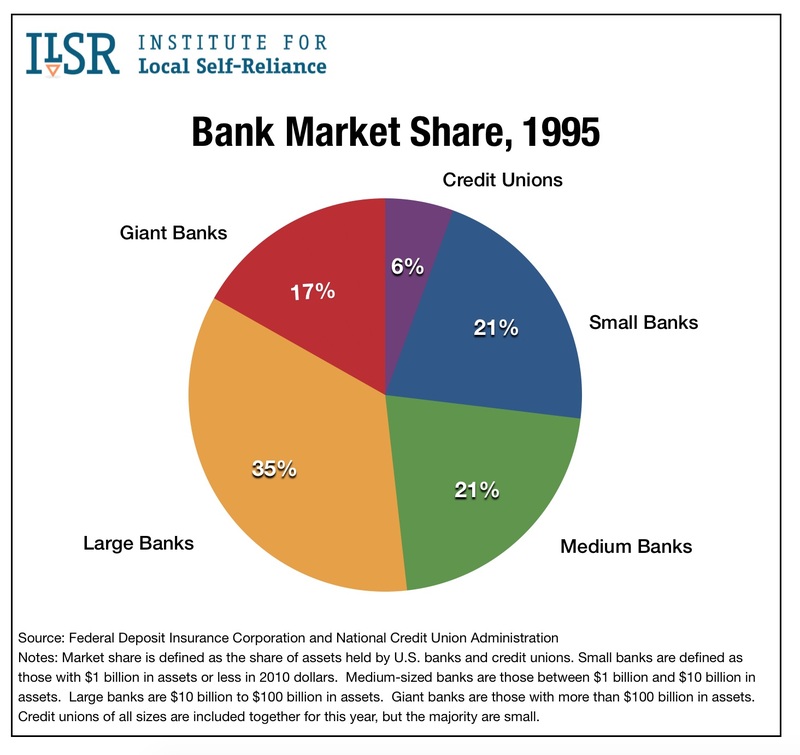 In 1995, small banks and credit unions held 27% of bank market share compared to the 17% held by giant banks. 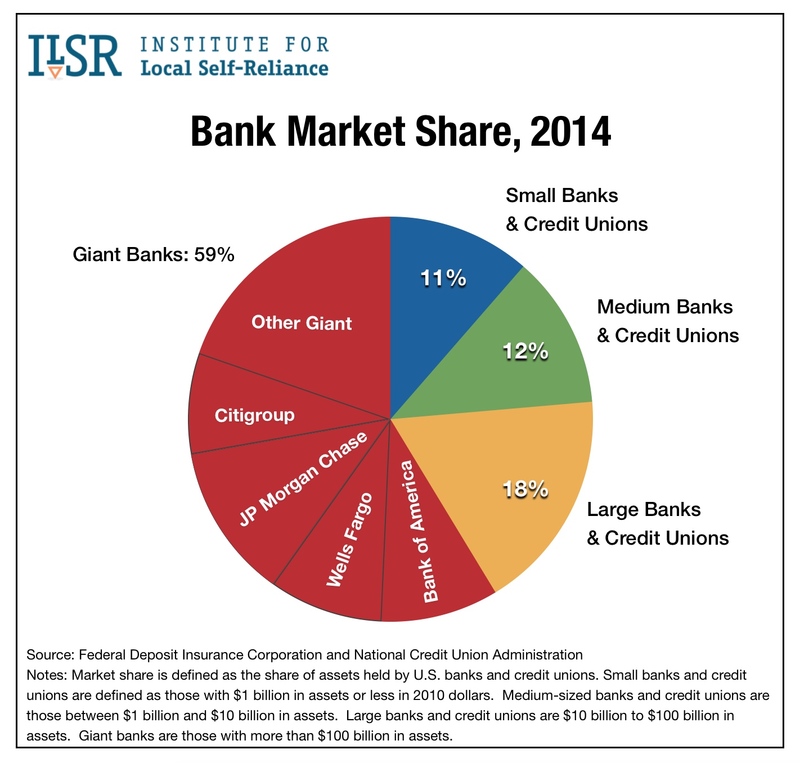 Today, giant banks control 59% of bank market share, more than five times as much as small banks and credit unions, and just four mega banks control most of that. Now, the four largest banks alone control 42% of all banking, yet they make a very small share of loans to job creating local businesses. Nor do they play nice with one another. These four mega-banks alone control nearly four times the amount of banking as all of the remaining small banks and credit unions put together. In the four years leading up to the great recession about 300 commercial banks disappeared each year but we were creating nearly half as many. The vanish-rate continues, but we’re creating only 6 new banks a year on average according to the Institute for Local Self-Reliance, the source delving into much of these data. Good policies and lending by small - usually stand-alone local banks -fueled the growth of America’s middle class in the 1960s and 1970s before anti-government rhetoric and deregulation began to hollow it out. It is likely no coincidence that today this powerful segment of households is rapidly shrinking or that the deaths of businesses now outnumbers the births of new businesses. As a moderate Independent, fiscally and socially, I find analysis intriguing that shows that nine out of the last ten recessions occurred under Republican presidents while Democratic presidents created nearly twice as many jobs per year. Of course, this illustrates how intricate and complex economic development is but that the underlying principles always come back to main street as well as the political courage to resist powerful special interests. It is also ironic that conservative states such as North Carolina where I live regulate cities and local governments from practicing the most basic tenant of economic development – buying local.